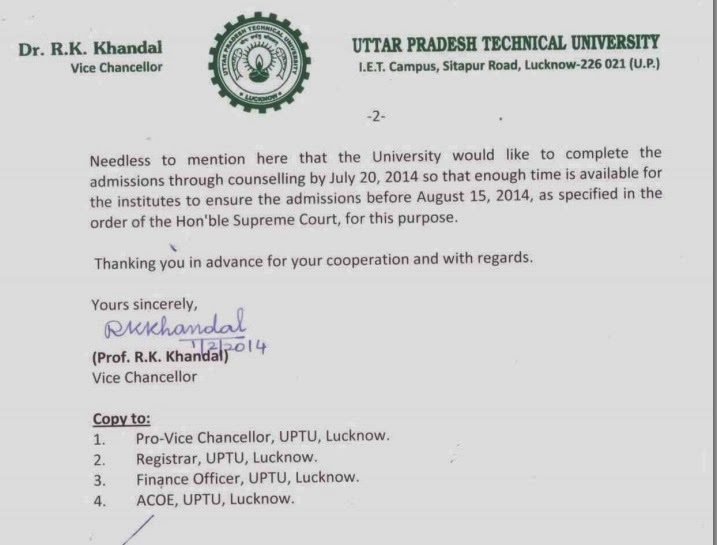 UPSEE 2014 Counselling Date Notification :- UPSEE 2014 Counselling Date Notification :- From the recent circular of UPTU The Uttar Pradesh Technical University Lucknow would like to complete the admission through UPSEE 2014 Counselling (Online & offline ) by 20th July ,2014 so that enough time is available for the UPTU (GBTU +MTU ) institutes/colleges to ensure the admission before 15th August,2014 ,as specified in the order of the Hon’ble Supreme Court, for this purpose . The UPTU/UPSEE counselling will be ended on 20th July 2014 , It is expected that UPSEE 2014 counselling will starts on Second week of June 2014 . UPSEE 2014 entrance exam will be conducted on 19th and 20th April, 2014. UPSEE 2014 result will be published till 5th June, 2014. UPSEE 2014 first round of counselling will be conducted till 30th June, 2014. UPSEE 2014 second round of counselling will be completed till 10th July, 2014. Last date for colleges to take approval from AICTE will be 10th April, 2014.